qCIO,QMS Advisors' Global Macro Fund is designed to produce alpha by utilizing a systematic top-down investment approach in a risk controlled framework. Our strategy's success hinges on our ability to translate our thorough fundamental Global Macro investment research into our robust, state-of-the-art dynamic quantitative models. Unlike qualitative beta-driven managers who generally benefit from the tailwind of broad market appreciation, the return from qCIO is derived solely from our ability to translate quantitatively our thorough fundamental research approach. Our scientific approach to investing enforces a strict discipline in the exercise of any investment decision. The aim of that stringent process is to exclude, as much as possible, qualitative or emotional influences that might cloud those factors that, sooner or later, will be understood to be the key forces driving the markets. In this way, recurring and identifiable inefficiencies spread across widely diversified markets can be repeatedly leveraged to potentially produce meaningful incremental returns. And it is these incremental, uncorrelated return streams that have made Global Macro strategies so attractive to today’s marketplace. A large body of evidence has emerged in recent studies confirming that macroeconomic factors play an important role in determining investor risk premia and the ultimate path of asset markets. qCIO utilizes widely tested financial and economic variables from these studies, as well as in-house research, and employs those findings in a time varying dynamic asset allocation model. The model we developed is based on Bayesian parameter estimation and model selection criteria. We find that using advanced Kalman filtering techniques to estimate time varying sensitivities to predetermined risk factors results in significantly improved sector return predictability over static or rolling parameter specifications. qCIO's dynamic bayesian framework identifies the current unobservable economic regime and adapts to economic regime changes. In essence, potentially regime-switching stylized facts such as an exit strategies from unconventional monetary policies, sovereign debt crises, the threat of higher inflation, etc. are embedded in our modeling framework and reflected in our investment process. A unique feature for a Global Macro fund that our superior quantitative framework allows. Our top-down quantitative investment process focuses on the macroeconomic drivers of financial asset performance. 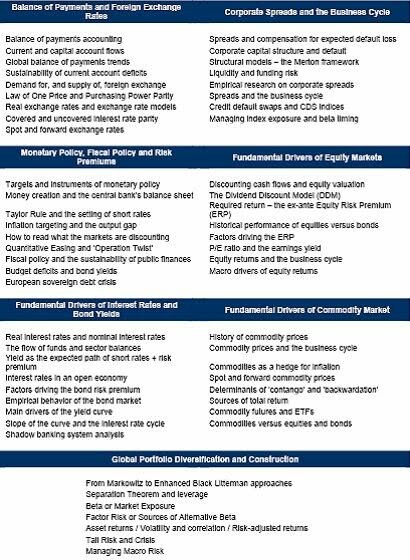 Identifying the theoretical determinants of pricing in each of the main asset classes (equities, bonds, commodities and foreign exchange) and analyzing their empirical behavior through the business cycle is the cornerstone of our approach. qCIO's superior quantitative methodologies allow for all significant independant economic and financial signals to be processed and analyzed in an unified and all-encompassing framework that systematically and dynamically assesses their relative impact to each pair of assets considered. qCIO's state of the art investment methodologies are in our view superior in that we rely on a unified quantitative approach to weigh each signal independently and in combination in a dynamic, adaptive framework to formulate our investment decisions.